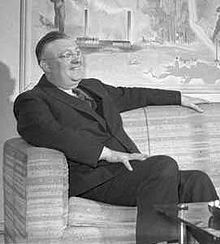 Roy Herbert Thomson, 1st Baron Thomson of Fleet, GBE (5 June 1894 – 4 August 1976) was a Canadian newspaper proprietor who became one of the moguls of Fleet Street. Established radio station CFCH (1931), acquired Timmins Daily Press (1934), successful newspaper and other media entrepreneur. He first came to prominence when he was selling radios in Ontario, and to give his customers more programmes to listen to, decided to launch his own radio station. He then moved into newspapers, buying The Scotsman as a salute to his Scottish ancestors, followed by the first Scottish independent television channel. By 1966, he owned both The Times and The Sunday Times. On 5 June 1894, Thomson was born as Roy Herbert Thomson in Toronto, Ontario, Canada. Thomson's father was Herbert Thomson, a telegraphist turned barber who worked at Toronto's Grosvenor Hotel (at Yonge and Alexander - now site of Courtyard Marriott), and English-born Alice Maud. Thomson's family lived at 32 Monteith Street, off Church Street in Toronto, Ontario. Thomson's paternal grand-parents were Hugh Thomson and Mary Nichol Sylvester. Thomson's grand-father Hugh was one of ten children of George Thomson, son of Archibald Thomson, who emigrated from Westerkirk, Scotland to Canada in 1773. Archibald was brother of David Thomson, first European settler of Scarborough, Ontario. Thomson’s ancestors were small tenant farmers on the estates of the Dukes of Buccleuch at Bo'ness, in the parish of Westerkirk, Dumfriesshire, Scotland. Thomson's ancestor, Archibald Thomson (born May 1749), migrated to British North America in 1773, marrying Elizabeth McKay, of Quebec. The family eventually settled in Upper Canada, but retained a sentimental attachment to their country of origin. During World War I, Roy Thomson attended a business college, and owing to bad eyesight he was rejected by the army. He went to Manitoba after the war to become a farmer, but was unsuccessful. Thomson travelled to Toronto again, where he held several jobs at different times; one of which was selling radios. However, he found selling radios difficult because the only district left for him to work in was Northern Ontario. In order to give his potential customers something to listen to he undertook to establish a radio station. By quite a stroke of luck, he was able to procure a radio frequency and transmitter for $201. CFCH officially went on the air in North Bay, Ontario on 3 March 1931. He sold radios for quite some time after that, but his focus gradually shifted to his radio station, rather than the actual radios. In 1934, Thomson acquired his first newspaper. With a down payment of $200 he purchased the Timmins Daily Press, in Timmins, Ontario. He began an expansion of both radio stations and newspapers in various Ontario locations in partnership with fellow Canadian, Jack Kent Cooke. In addition to his media acquisitions, by 1949 Thomson was the owner of a diverse group of companies, including several ladies' hairstyling businesses, a fitted kitchen manufacturer, and an ice-cream cone manufacturing operation. By the early 1950s, he owned 19 newspapers and was president of the Canadian Daily Newspaper Publishers Association, and then began his first foray into the British newspaper business by starting up the Canadian Weekly Review to cater to expatriate Canadians living in Britain. In 1952, Thomson moved to Edinburgh and purchased The Scotsman newspaper. In 1957, Thomson launched a successful bid for the commercial television franchise for Central Scotland, named Scottish Television, which he was to describe as a "permit to print money" (often misquoted as a "licence to print money"). In 1959, Thomson purchased the Kemsley group of newspapers, the largest in Britain, which included The Sunday Times. Over the years, Thomson expanded his media empire to include more than 200 newspapers in Canada, the United States, and the United Kingdom. His Thomson Organization became a multinational corporation, with interests in publishing, printing, television, and travel. In 1966, Thomson bought The Times newspaper from members of the Astor family. In the 1970s, Thomson joined with J. Paul Getty in a consortium that successfully explored for oil in the North Sea. A modest man, who had little time for pretentious displays of wealth, in Britain he got by virtually unnoticed, riding the London Underground to his office each day. Nonetheless, he made his son Kenneth promise to use the hereditary title that he had received in 1964, if only in the London offices of the firm. In 1952, Thomson moved to Edinburgh. In 1976, Thomson died in London, England. A plaque was placed in the crypt of St Paul's Cathedral. After Thomson's death in 1976, his son Kenneth Thomson became chair of Thomson Corporation and inherited the baronial title becoming the 2nd Baron Thomson of Fleet. With the Thomson operations now principally again in Canada, the younger Thomson did not use his title in Canada though he did so in Britain, and used two sets of stationery reflecting this dichotomy. In any case, as the peerage title he had was inherited, it did not debar him from retaining his Canadian citizenship, and he never took up his right to a seat in the pre-1999 House of Lords. Roy Thomson Hall, one of Toronto's main concert halls, is named in his honour as the Thomson family donated $5.4 million to its construction. In the 1964 New Year Honours, it was announced that Thomson would be elevated to the peerage as a Baron "for public services". On 10 March 1964 he was made Baron Thomson of Fleet, of Northbridge in the City of Edinburgh. In order to receive this title, it was necessary for Thomson to acquire British citizenship, as the Canadian government had made it common practice since 1919 to disallow the conference of titular honours from the sovereign on Canadians. However, the Canadian Citizenship Act between 1947 and 1977 stated that any Canadian who became a citizen of another country through means other than marriage would cease to be a Canadian citizen. Thus, Thomson lost his Canadian citizenship in the process. He was appointed Knight Grand Cross of the Order of the British Empire (GBE) in the 1970 New Year Honours. ^ "Roy Herbert Thomson, 1st Baron Thomson | British publisher". Encyclopedia Britannica. Retrieved 2017-07-10. ^ "Roy Herbert Thomson, 1st Baron Thomson of Fleet, GBE". geni.com. Retrieved 2017-07-10. ^ Goodman, Geoffrey (2006-06-12). "Lord Thomson of Fleet". The Guardian. ISSN 0261-3077. Retrieved 2017-07-10. ^ "Edna Alice Irvine". Geni.com. Retrieved October 5, 2018. ^ a b c "Descendants of Adam THOMSON and Margaret CRANSTOUN". glendinning.name. Retrieved October 5, 2018. ^ a b "No. 43200". The London Gazette (Supplement). 31 December 1963. p. 1. ^ "No. 43267". The London Gazette. 10 March 1964. p. 2189. ^ a b "No. 44999". The London Gazette (Supplement). 1 January 1970. p. 8.